This months gardening tips – Things to do this month. 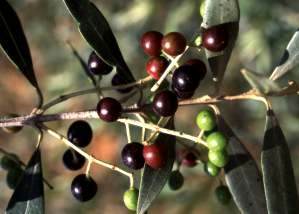 This tree is a neatly shaped evergreen with a dense spreading crown of up to 12m of glossy grey green to dark green leaves with a grey underside. The rough grey bark sometimes peels off in strips. Flowers from October to Feb with sprays of white scented flowers . Small spherical fruit is thin and fleshy ripening to a purple black colour in March to July and can be eaten raw. Make relishes or Olive and Onion Marmalade with the fruit. It is frost, drought and wind resistant making it a hardy tree found widespread throughout Africa, Asia, China and India. Fruit is popular amongst people and wildlife (monkeys, baboons, mongoose, warthogs and birds) Leaves are browsed by game and stock . Its leaves can be made into tea, the fruit eaten raw or ink made from its juices and the hard, heavy beautiful wood can be used to create furniture, ornaments , spoons and durable fences. Traditional remedies made with this plant serve as eye lotions and tonics, lower blood pressure and improve kidney function as well as healing sore throats. Early Cape settlers used the fruit to treat diarrhoea. Propogate from seed or hardwood cuttings. Sow fresh seed in river sand. treat cuttings with rooting hormone. A valuable asset in the garden with its beautiful flowers , attractive foliage and decorative form. Aloe Arborescens develops into a multi-headed shrub 2-3m high with striking grey green leaves arranged in attractive rosettes. Large colourful flowerspikes brighten the winter months from May to July with deep orange and pure yellow colours. Flowers produce nectar, attracting birds, bees and butterflies to the garden. 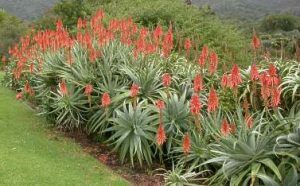 Aloe Arborescens is distributed along the eastern summer rainfall areas of the country going from sea level all the way up to mountain top. Aloe is derived from the Greek Alsos meaning bitter – the taste of the leaves, while Arborescens is Latin for treelike and krantz refers to the most common preferred habitat of rocky ledges and cliffs. It was commonly planted around kraals and homesteads as a natural living fence. The Zulus used the leaves , dried up and crushed as protection from storms. Decoctions of the leaves are also used in childbirth and treating sick calves. In Transkei it is used to treat stomache ache and prevent chickens from getting sick. Also widely used to treat burns , wounds and abrasions. Attractive, fast growing , spreading herbacious groundcover which grows to about 500mm high. Leaves are simple and dark green with cream coloured flowers with purple markings. Flowers are produced over a long period (autumn to spring) and are followed by capsules with brown seeds. Semi hardy requiring protection from frost it grows rampantly in semi tropical areas. Widely distributed from tropical Asia to Southern Africa. 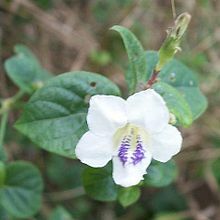 Asystasia means inconsistency – relating to the fact that the corolla is more or less regular ( which is unusual for the Acanthaceae family of plants) Gangetica is derived from the ganges river – where it is assumed the plant is derived. Leaves have been eaten by locals as a spinach. Propogate from cuttings after flowering or by removing root runners. What To Do In The Garden This June. remove all green growth from varigated plants to stop them reverting to green. chop off the top of young hedge plants to encourage dense basal growth. Thanks for reading this month’s article. See you again next month !